Here is a collections of the free jQuery HTML5 lightbox plugins that you can use for your website to showcase your photos in beautiful way. HTML5 is the latest version of HTML (HyperText Markup Language) and most of web browser support HTML5. Besides to display photos, this lightbox plugin also support other multimedia types such as video extension and embed a youtube video. 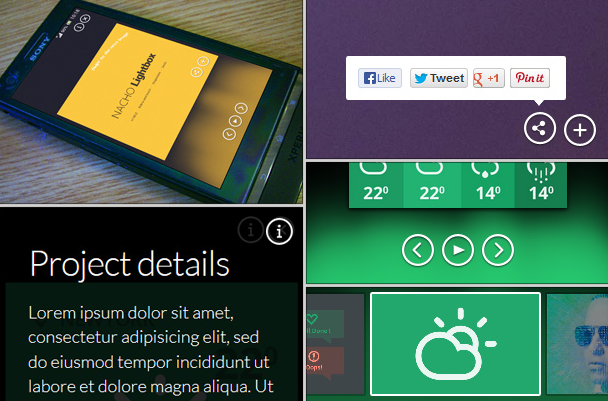 Some HTML5 lightbox plugin also support responsive layout which optimized for mobile device. Please check the license on the author page if you want to use this lightbox plugin for commercial project. Plugin Description : h5 lightbox is a jQuery lightbox plugin built on HTML5. It uses the HTML5 data attribute to add a larger version of an image then displays that image in a simple modal lightbox. Plugin Description : Webbox is simple but powerful free jQuery HTML5 lightbox plugin. Small (only 10.6 kB) and No images are needed for the basic style, everything is designed with CSS3. Plugin Description : bLightbox is a minimalistic HTML5-ready lightbox plugin which cross platform with modern browsers and supports Youtube and Vimeo embedding and mobile devices. Plugin Description : reLightbox is a Responsive lightbox with Supports HTML5 Fullscreen, preloading and keyboard navigation.